New research sheds light onto how different bacterial species can build complex nano-harpoons with different protein building blocks. Bacteria use these harpoons called Type VI secretion systems to inject toxins into nearby cells. 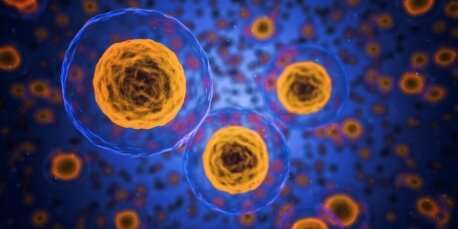 Researchers from the University of Sheffield found that while the proteins varied, there were structurally similar portions that interacted with the machinery. Bacteria produce complex nano-harpoons on their cell surface. One of their functions is to harpoon and inject toxins into cells that are close by. Producing such a complex weapon requires lots of different moving components that scientists are still trying to understand. Researchers from the University of Sheffield have been using some of Diamond's crystallography beamlines to understand a particularly enigmatic piece of this tiny puzzle. The team led by David Rice and Mark Thomas worked on a protein component of the harpoon called TssA which they already knew was an integral piece of the machinery. However, unlike the other components of the harpoon, there are distinct variants of the TssA protein that contain radically different amino acid sequences at one end of the protein. The team showed that the structures of the variable region of two different TssA subunits were completely unrelated and they could assemble into distinctly different multisubunit complexes in terms of their size and geometry. This begged the question as to how different bacteria could use this protein with different structures to produce a harpoon with the same function across all species. They found that despite these differences, there was a very specific conserved region at the other end of the protein. They hypothesise that the conserved region is the part that does the work and helps the harpoon to function whereas the variable region acts as a scaffold. They used I02, I03 and I24 in their study and plan to do follow up work using X-ray crystallography and Cryo-EM such as those at the eBIC centre at Diamond. The research was published in Nature Communications. Biological warfare in bacteria is relatively well known. A group of bacteria want to annex a scarce resource for themselves, so they produce a toxin to which they are immune and kill off any potential invaders. However, some bacteria take a more directed approach. Instead of spewing out toxins into the extracellular milieu, they mount miniature harpoons on their outermost surface and swim around injecting toxins directly into potential aggressors or competitors. This isn't an exaggeration or a metaphor, right now bacteria are swimming round literally harpooning one another to death. These harpoons are named type VI secretion systems (T6SSs) and since their discovery in 2005 researchers around the world have been trying to understand this miniature feat of engineering. 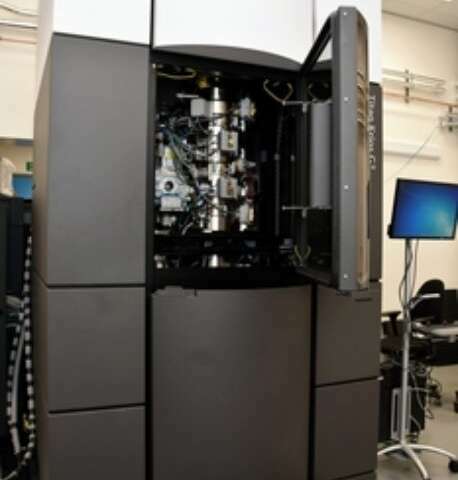 The make-up and complexity of these molecular machines present perfect problems for structural biology and many of the protein components of these machines have been examined using X-ray crystallography or cryo-Electron Microscopy. Research has shown that the entire system consists of a protein complex that forms a large chamber that is anchored into the membrane. This holds a sharpened tube that is ejected as soon as a sheath around it contracts against a protein baseplate located at the base of the chamber, firing the harpoon into an unsuspecting neighbour. While a lot is understood about T6SSs, there are still some critical components that remain enigmatic, one of these being the TssA protein. Many studies have shown that this protein is an integral part of the T6SS machinery, but research into the DNA that encodes this protein show that that between species, there is a lot of variation. Variation is not normally desirable in proteins that have an essential function, if you have a recipe that works, it's not a good idea to suddenly change a significant part of it. This raised some questions, what does the TssA protein do and what effect do these variations have on the function? How does the TssA protein function? The research team started by doing an analysis of the amino acid composition of four different TssA proteins. They found that if they laid the protein sequences in a line, the left-hand-side or N-terminus was always very similar, and the right-hand-side or C-terminus varied a lot. The team wondered if these differences would stop the TssA protein from interacting as expected with the other proteins needed to build the bacterial harpoon. They performed lab tests and found that in fact, the TssA protein interacted with almost all of the other components of the harpoon exactly as expected. To understand why, they made several trips to Diamond to use the I02, I03 and I24 beamlines for macromolecular crystallography. By analysing the data from the different TssA proteins the found that they had very different structures. This not only affected how single proteins looked but also how they interacted with one another to form multisubunit complexes. The research team already knew about a published structure of the protein that formed into a 6 membered ring when assembled. However, their new studies revealed that different versions of the TssA protein could form 5-membered or 16-membered rings. Despite the differences, all of the TssA proteins had a structurally conserved portion that was always located on the outside of assembly complexes. This led the research team to hypothesise that it was this conserved section that was involved in the functioning of the bacterial harpoon. They reasoned that the rest of the protein that contained all the variation was acting as a scaffold to hold the working unit of the protein complex. While the evidence is compelling there is still more work to be done. Professor David Rice said that "the future of this work is getting more examples from different bacterial species and combining crystallography data with Cryo-EM techniques." Ultimately the team would like to investigate the structure and function of the entire T6SS complex from different bacteria to check if their hypothesis is correct. They plan to use X-ray crystallography at beamlines such as I03, I24 as well as the newly constructed VMXi. They also plan to use Cryo-EM which is also available at Diamond's eBIC centre. The combination of these complementary structural biology techniques will allow the researchers to build up a more complete image of how this complex piece of nanomachinery is constructed and how it functions. The techniques used can also inform other researchers with similar questions. Previous data had suggested that the TssA protein was a homologue of a baseplate protein found in bacteriophage. This study showed that not only was this not the case, but that the TssA proteins were very different from one another and had initially led scientists to wrongly assign the function. Detailed work on the protein sequences, interaction studies and careful structural biology experiments allowed the research team from Sheffield uncover a more accurate picture of this important microbial weapon. The research is also of great interest to chemists and engineers who can take inspiration from the bacteria to produce nanomachines of their own. There are potential applications in infection control where the harpoons could be targeted by new drugs to disable bacteria that employ them when causing infections. There are also applications in drug delivery where the harpoons may be used to inject peptide and protein drugs into specific target cells. On a more fundamental level, simply understanding how such a small and complex moving machine can be constructed and how it functions could one day help us to build our own.